Fishing rafts and whitewater rafts are basically one and the same. They offer a thrilling and exciting way to fish rivers and experience whitewater rafting. They also are much safer than boats not specifically designed for serious whitewater use. Rafts are incredibly resilient and difficult to swamp even if they overturn or suffer a puncture. Some raft designs are better suited for certain applications than others. The best fishing raft for your purposes will depend on what you want to do. So how can you know which raft will perform for your rafting needs? Fly Fishing Atlas brings you the best rafts for fishing and thrill-seeking whitewater rafting. The rafts reviewed here are terrific for use as fly fishing rafts, family rafts, or as wave-blasting whitewater rafts. They offer a stable and comfortable ride through turbulent and shallow water, as well as an exciting ride through various classes of whitewater. If you are content with wading the shallows, then you might like our review on the best fishing waders. But if those deep mid-river runs are calling your name, then this article is for you. Fishing for your species of choice from a river raft is an absolute joy. Many anglers that have invested in a river raft say they wish they had bought one years ago – as it would have opened up a lot more water to access and fish. Rafts with removable frames can have a dual purpose of either whitewater raft, or fishing raft. When needed, the addition of a rafting frame or fishing frame will be beneficial for several reasons including control, stability, and function. You’ll need a raft that features D-rings for attaching a frame. Some raft companies also make rafts with integrated frames which cannot be removed. Knowing what performance level you need from your raft will help guide your decision making process when it comes time to buy. A raft designed for relatively calm water is unlikely to perform well if you need to blast through class 4 whitewater. Larger rafts also won’t be as nimble as smaller rafts, but they will handle better in big water with heavier loads like those required for multi-day trips. The raft you choose needs to have enough room for your gear and the people that ride in it. We focused primarily on rafts in the 12-14 foot class, since those lengths are by far the most popular for general recreation and often make the best fly fishing rafts. Larger and smaller rafts will perform better in specialized roles, but not as well for general use. Before you choose a raft to launch yourself and others into powerful river conditions, one thing should be prioritized more than anything else: safety. No matter how wonderful the price tag on a raft might be, you should never compromise safety to save a few bucks. If the raft has a failure that causes injury to you or others, it will cost you way more than what you would have spent on a more worthy and proven raft. The material used to construct the raft will have an impact on the durability and price of the raft. PVC is a durable material that is commonly used in recreational raft construction. More expensive materials like polyurethane, Hypalon, or Pennel Orca will increase cost, but also dramatically increase durability for serious rafting applications. Many more rafts are damaged during transportation than when they are being used in the water. Its very important that you have a good plan for protecting your raft when you move it to and from the water. When they are deflated, rafts can be placed in a vehicle. But if you want to keep your raft inflated during transport you might consider using a trailer or a truck rack. If you unload your raft by yourself then you can avoid dragging through sharp rocks and sticks by using a boat trolley. The top choice for Whitewater Fishing Rafts is the 13 Foot Saturn Inflatable Whitewater Raft. Meeting at the perfect crossroads of affordability, portability, and maneuverability, this raft continues to exceed users’ expectations. This 13 foot whitewater raft is a well-crafted boat that earns its keep on rough whitewater and smooth fish filled runs. With enough room to comfortably carry 8 adults, a well-balanced layout, and solid construction, this is a solid class 5 whitewater river raft. The 13′ length and 6’5″ width is enough to punch head first into big whitewater. But the raft can also access water that might be inaccessible with a deeper riding 14 or 15 foot raft. The capable width is well suited for fly fishing rafts that need to sneak through tight constraints of river canyons and boulder strewn runs seeking big trout. Leafield C7 valves provide for quick inflation when you get to the water. 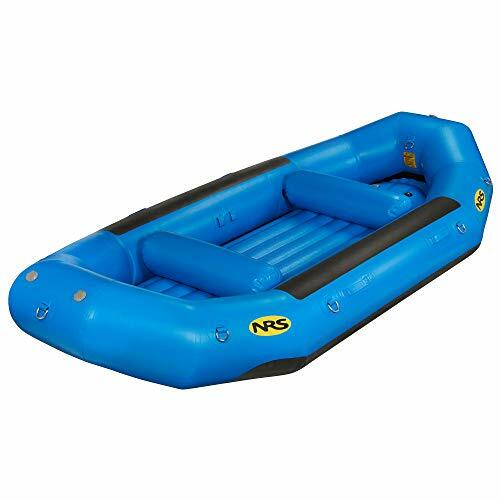 An NRS blast inflator pump will help to inflate the raft quickly and bring the self bailing air deck floor up to the proper rigidity. The raft is equipped with long waterlines, large tube diameters, and broad beams to make this raft one of the most stable fishing rafts on the market today. Durability is greatly enhanced with a 5-layer PVC floor which provides a super rugged surface when slamming around in the rocks and skinny water you’ll find during certain seasons. The reinforced floor design provides over 2.4mm of protection where you need it. That is a huge benefit when you need to focus on targeting hungry trout and bass. Put your mind at ease without having to worry about every rock in the river. Standard features of the 13′ Saturn Whitewater Raft are 2 removable thwarts, 12 exterior D-rings including 4 angled D-rings for better frame strapping, rubberized handles for easy carrying, chaffing protection on the top sides of the exterior tubes, 1 repair kit, carrying bag and a 3 year warranty. The 13 foot Saturn Whitewater Raft has a reliable design and proven track record for safety. 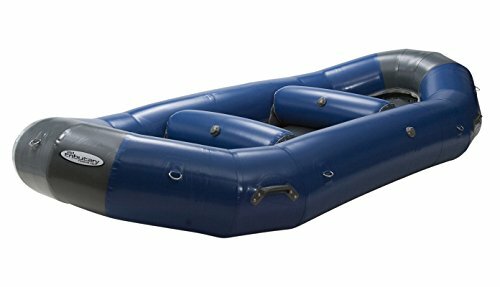 Rest easy knowing that the raft features four exterior air chambers, an inflatable dropstitch floor, and two more air chambers within the removable thwarts. These multiple air chambers help to provide a safe return to shore in the case of an accidental puncture. Another great feature is the rubber strake which provides a thick protective layer surrounding the exterior tubes. Buyers comment that the raft can take serious abuse from skinny water, being wrapped on rocks, and being dragged on gravel. With a 3 year warranty and reports of Saturn rafts lasting around ten years of regular abuse, you can be sure the durability is truly stout. Weighting in at 125 pounds, you’ll likely need a helper for loading and unloading more due to the awkward size than the weight. Users report being able to strap the raft on their truck’s roof rack to avoid complete deflation during transport. And the six carrying handles are a huge addition to the raft’s overall mobility. The general opinion of users of the 13 foot Saturn Raft is that it is tremendously fun, reliable, and stable. They say the price can’t be beat with excellent quality. The raft tracks very well and is easy to maneuver. 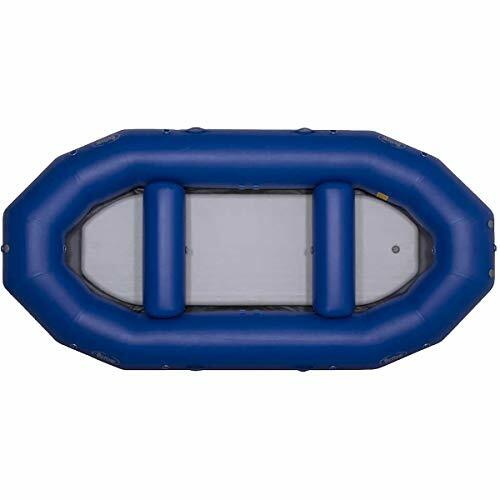 Our recommendation is to choose this raft if you are in need of an inexpensive, maneuverable, and highly capable raft rated for class 5 water. 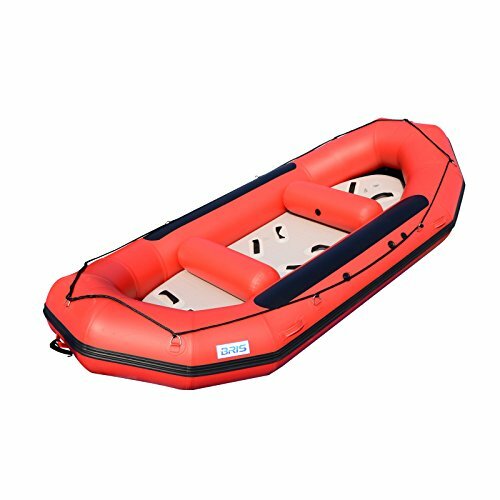 Saturn offers other rafts that range from their smaller 9 foot 6 inch model up to their 16 foot raft. As to be expected, large Saturn rafts have an increased capacity for storage and passengers. But for the price, this one offers the most value and practical function as a fly fishing raft and for whitewater rafting. If you are in need of a larger raft, or need more carrying capacity, check out some of the other rafts that we recommend. NRS has a truly incredible reputation. From fly fishing guides to rafting guides, you’ll hear the vast majority of them recommend NRS rafts, and raft frames. In fact, NRS frames are so popular that many raft manufacturers recommend pairing their rafts with NRS raft frames. Among the rafts produced by NRS, the Outlaw 140 is a has a super solid track record for multi-day trips and tackling big whitewater. A 7 foot 2 inch width provides carrying capacity for lots of gear and stability, while still remaining small enough for technical whitewater. The wide ranging capability of the NRS Outlaw 140 has brought it to be considered by many river guides to be all-around the best fly fishing raft on the market. As a stand alone raft, the Outlaw 140 carries up to 8 or 9 paddlers with an optional third thwart. For angling, adding a fishing frame will obviously change that arrangement. For serious fishing excursions, the fishing frame transforms the raft into a laser-focused fishing machine. Twelve stainless steel 2 inch D-rings provide plenty of tie-down points for the frame and additional gear. And the removable thwarts open up the floor plan for coolers and all sorts of gear. Super heavy duty 2000 denier PVC tubes make the NRS Outlaw ready to take a punch and keep paddling. Three main tube air chambers help to keep things afloat in the event of an accident. In addition, two more air chambers are located in the removable thwarts. The raft comes standard with a repair kit and a 3 year warranty. The last air chamber is the ultra-rugged 4 inch thick 4000 denier PVC drop-stitch floor. The floor insert inflates to a rigid 8-10 psi, providing a stable standing platform and giving the boat a stiffer wave-punching ride. In order to get the floor properly inflated to provide a rigid structure you will need a high-pressure pump. The Outlaw 140 weighs in at 153 pounds. With rafts of this size being pretty awkward to wrangle, an extra set of hands will be helpful with loading and unloading the raft. And four carry handles really help to control the raft while you are carrying to to the water. River guides suggest partially deflating rafts whenever possible to facilitate easy transport from one area to another. And if you keep some air in the raft it will allow for easier re-inflation at the put-in. The Outlaw 130 features Leafield C7 Valves that make for really easy inflation/deflation of the tubes, thwarts and floor. Buyers have favored this 14 foot Outlaw from NRS for a long time. Most guides agree that the NRS line of rafts more than satisfies their needs. They say it is an enjoyable boat, handles terrific, and isn’t overly difficult to move around when out of the water. The Aire Tributary 12 HD is an excellent choice for the fishing fanatic or river guide. It is stable enough for a family adventure, but also agile enough for a small 4-5 person paddle team in technical whitewater. And for fishing guides, the slightly down-sized dimensions of the Aire Tributary 12 gives the raft a nimble mobility that you won’t find with larger rafts. Aire has a top notch reputation among river guides and whitewater aficionados. In fact, Aire manufactures the tubes and urethane air chambers for a number of other well-known raft companies because their products are so exceptional. Aire rafts are built to take on challenging and technical water, but the overall comfort and quality of design really shows during long days on the water and fishing expeditions. Aire’s Tributary 12 excels on small, tight rivers where larger boats wouldn’t dare to go. Which means it needs to be rugged enough to take bumps and bangs from rocky bony water. The beefy 42 oz. 2000 denier PVC construction is well prepared for the rigors of whitewater rivers. The outer shell and inner urethane bladders sport welded seams that take durability to the next level. The main tubes contain three air chambers which provides a good safety margin in case of an accident. The tubes are also zippered to allow for easy access to the bladders in case repairs are needed. Aire integrated cam straps to install the two thwarts, which allows them to be moved anywhere along the inside of the boat. Or you can remove the thwarts to open up the floor for storage, and install a rowing or fishing frame. Ten D-rings are available for tying down frames and gear. The lace in floor bails water quickly. Mobility in and out of the water is a big plus. With a weight of 104 pounds and a length of 12 feet 4 inches, the Tributary 12 HD is much easier to handle out of the water than larger rafts. Four carry handles located around the boat make moving the raft a snap. Leafield B7 valves allow for easy inflation and deflation. The Tributary 12 HD is a fairly unique size among river rafts, while still boasting a carrying capacity of 1200 pounds. It’s affordability and maneuverability makes it well worth considering if you are in the market for a whitewater or fly fishing raft. While Aire rafts are fun and tough, they are also built to withstand the rigors of regular river use. The Tributary 12 HD comes with a 5 year warranty. Aire rafts have an unparalleled reputation among raft and river guides. The BRIS 13 foot River Raft is an incredible value among whitewater rafts. 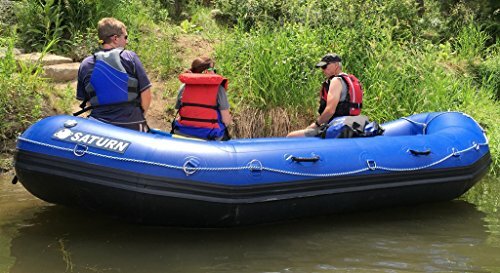 With an 8 passenger capacity for a little over $1000, this raft allows you to experience river adventures at a fraction of the price of other rafts. BRIS rafts don’t have the long-standing reputation of NRS and Aire. Regardless, customers rave about the quality and capability of this raft. The main tubes are constructed with 2000 denier high quality PVC with a 1.2mm thickness. The bottom is also made from heavy-duty 1.2mm thick PVC with a 140mm wide rubber strake around the bottom of the main tubes. Full length side strakes provide an added layer of protection against abrasion and damage. The main tubes contain four individual chambers for a good safety cushion in case of an accidental puncture. The removable 140mm dropstitch inflatable floor is a self bailing design with bailing holes around the perimeter. The tubes are equipped with pressure release valves to resist over-inflation. The BRIS 13 foot Whitewater raft weighs in at 128 pounds, which is about average for a 13 foot raft. BRIS provides soft lifting handles with one at the bow and stern, and two on each side. Loading and unloading the raft won’t be a problem. For fishing and rafting frames, BRIS provides additional frame rub material topside of each tube. And to strap down frames and fishing gear, the BRIS 13 Foot Raft offers 10 D-rings around the perimeter of the main tubes. The raft comes with 2 thwarts , one set of oars, a foot pump, a carry bag and repair kits. The general opinion of users of this product is that it is a good quality raft at a great price. Reviewers report taking the raft through class 2 and 3 whitewater with great control and solid stability. Less expensive than most 13 foot rafts. Self-bailing floor may need adjustment. This video shows a good walk around of the BRIS 13 Foot River Raft, though the sound quality isn’t the best. 30 Days money back guarantee. All of our boats come with 3 year manufacturer warranty. Guarantee begins when product is delivered. Premium Quality Materials : BRIS rafts are made by 2,000 Dtex 1.2mm PVC fabric with polyester support, having excellent resistance to tearing, tension and breaking . It is a much more heavy-duty PVC fabric than 1100 Dtex 0.9mm PVC rafts . Fabric is thick, puncture proof and abrasion resistant.These are commercial grade, exceptional quality and workmanship water crafts . and best of all, they are not expensive, so you can go rafting, without stretching your budget! All seams are HEAT WELDED for perfect seaming and guaranteed to last in fresh water, salt water and extreme humidity. Most seams are quadruple overlap for maximum strength and durability and will not fall apart . Features: Removable high-pressure drop stitch floor is very stable . unique self-bailing system gives you the chance to choose the best speed for optimum performance. three inflatable thwarts are completely detachable and removable. Safety valves prevent over inflation in tubes .all around rubber strake protection and boat life line .The bottom of the tubes covered with 140mm width protecting rubber . 10 D-rings outside for optional frame attachment. Included: PVC Hull, Drop stitch floor, 2 x Inflatable thwarts, Repair Kit, Carrying Bag and Foot Pump. Among the many reputable NRS rafts, the Otter 130 stands apart. All NRS Otter Series Rafts are made to outfitter-grade standards. Fishing and rafting guides don’t hesitate to recommend NRS rafts. And the NRS otter 130 is the most popular raft in the Otter Series. The Otter 130 has a bomb-proof reputation and construction. And at 6 feet 2 inches wide the raft is ideal for both narrow streams and big water. Bigger rafts may have slightly more carrying capacity, but the Otter 130 makes no sacrifices in stability. The Otter 130 can take you where no drift boat can. And larger rafts will either be too wide or drag bottom and be unable to pass shallow and skinny water. And the Otter 130 rides great even while fully loaded for a weekend trip. As a stand alone raft, the Otter 130hold up to 8 crew members. Adding a fishing frame brings the Otter 130 into a class of its own, with an unmatched fishing prowess. And for serious angling adventures, the HD40 floor armor on the bottoms of the tubes guards your boat from the wear and tear of boulders and beaches. Twelve stainless steel 2 inch D-rings provide plenty of tie-down points for rowing or fishing frames and additional gear. Frame wear patches come standard on the topside of each main tube. And the removable thwarts open up the floor plan for coolers and all sorts of gear. Though a third thwart can also be added if needed. Heavy-duty Pennel Orca material is super abrasion resitant as well as chemical and UV-resistant. Three main tube air chambers help to keep things afloat in the event of an accident. In addition, two more air chambers are located in the removable thwarts. NRS offers a proprietary BAT (Batten Attachment Thwart system) that lets you easily add or remove thwarts to provide accommodations geared toward both paddlers or anglers. The raft comes standard with a repair kit and a 7 year warranty. The floor insert inflates to a rigid and stable standing platform, giving the boat a stiffer wave-punching ride. In order to get the floor properly inflated to provide a rigid structure you will need a high-pressure pump. And the pressure relief valve regulates the floor pressure during inflation automatically. The Otter 130 weighs in at 104 pounds, which is quite lightweight for a 13 foot raft. Even though rafts of this size can be pretty awkward to wrangle, the lightweight nature of the Otter 130 really helps with loading and unloading. And four carry handles really help to control the raft while you are carrying to to the water. All NRS rafts, including the Otter 130 feature Leafield C7 Valves that make for really easy inflation/deflation of the tubes, thwarts and floor. During transport, river guides suggest partially deflating rafts whenever possible to facilitate easy transport from one area to another. And if you keep some remaining air in the raft it will allow for fast re-inflation at the put-in. Buyers report over ten years of use with the raft remaining in like-new appearance. Multiple buyers report using their Otter 130 to navigate class 5 water. Others reminisce about enjoyable adventures around the country’s many terrific rivers, from technical rapids to low water. Buyers also report being impressed with the small shipping package (41″ x 27″ x 12 and weighs 115 lbs), and the raft’s ability to be stored in a small space. If you need a fishing raft that is ready to rock and roll, then these raft packages are the answer. Some of these boats do not allow for the fishing frame to be removed. So if you will need to remove the frame for the thrill of blasting through whitewater for the pure adrenaline rush, then you should consider the Outcast PAC 1300 or 1400, or purchase your raft and frame separately. Outcast PAC 1400 Pontoon Boat - with $250 gift card and in lower 48 states!